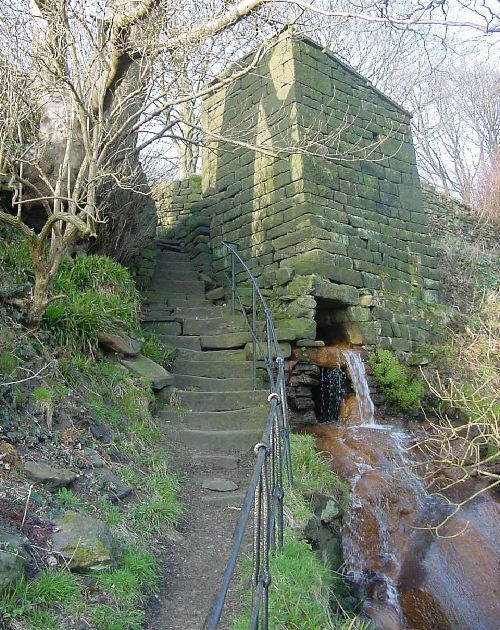 The Pennine Way runs above Jumle Hole Clough on the Eastern side, passing old Naze Chapel. The chapel opened in 1842 after occasional services were held in the area since 1836. 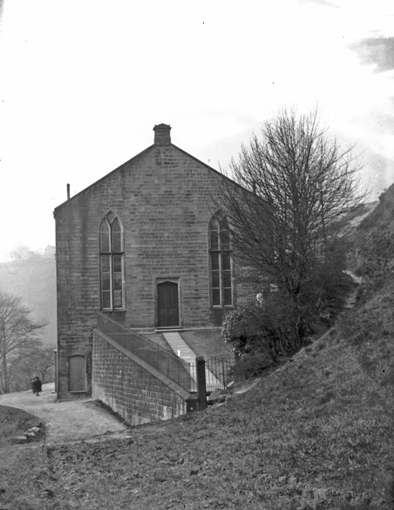 The chapel was an offshoot of mount Zion at Heptonstall. 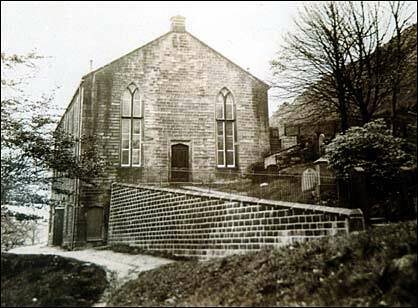 You can see from this early photo that the chapel had a landscaped garden in front of it. This later became a small graveyard with a number of headstones which can be seen in the photo below and many of which are still standing. Click here to see photos and transcriptions of the existing grave stones. The first entry in June 30th 1845 "School meeting held at the hall?, Samuel Smith in the chair"
1846 "The name of the building Mount Olivet to be inscribed on stone on the front of the building"
"1866 Looking for a teacher for the day school and a preacher"
9th November 1872, "9 people to be baptised in the lodge owned by Mr. Stead at Jumble Hole"
In 1909 the Chapel was moved down to the Halifax road with the old chapel being demolished after the war. Every year the old chapel used to have an anniversary celebration with brass band. 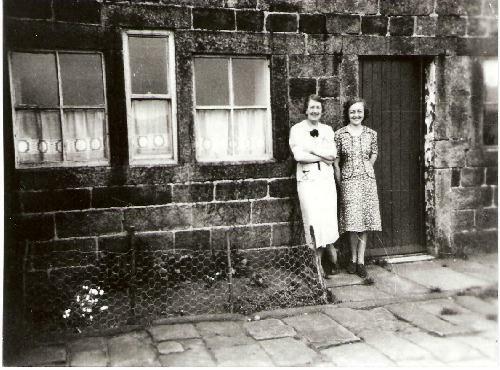 An adjacent house occupied in the 20s by a Mr. Greenwood who was manager of the co op. This photo was taken in 2002. There are several large houses in the Underbank area - Underbank Hall and Lacy House are within four hundred metres of each other on the level ground almost in the valley bottom. Underbank House is 750 metres west of Lacy House, nearer Hebden Bridge, about 150 metres altitude. Higher Underbank House is much higher up the hillside from Underbank Hall and Lacy House. Higher underbank is a small cluster of houses half way up the hillside, on the Pennine Way. 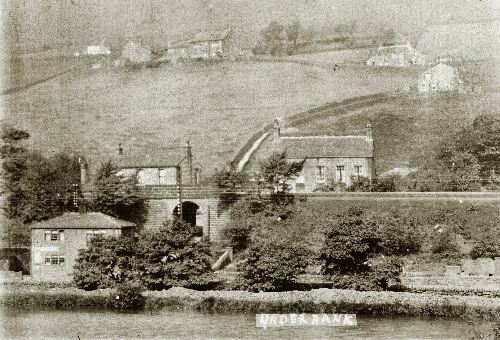 The photograph of Higher Underbank, shows Callis Mill in the Background. The main dwelling is Higher Underbank House which was thought to have been built about 1612, but around 1770 a new frontage was added. This is a fine example of a yeoman clothier's house where spun wool would have been brought to and sent out for weaving and the finished product then sent out to market. On the rear wall you can see the blocked up intake door where goods would have been hoisted up. Nearby there is an unusual inscription on the rear wall of Higher Underbank House. We are unsure what kind of lettering it is but it has been said that it might be weavers script. It is also unclear what it says, but it has been said that it is a vernacular interpretation of the Greek words for Jesus Christ or that it stands for John Horsfall who had Higher Underbank built. It was an expensive piece of work as the lettering stands out from the stone. Winters is situated on the lip of the valley. It consists of a terrace of cottages, the remains of Winters Mill, a mill dam (now a garden) and some other buildings. The original site combined a farm and mill with associated buildings. In 1842 a survey and valuation of Winters was completed ". The part of the valuation that covers domestic buildings is set out below. Click here to see the valuation of the mill machinery. 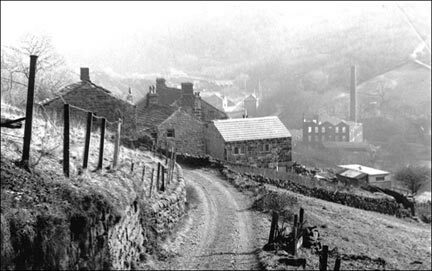 On the 25th February 1868 Winters Mill was hit by lightening and great damage was done. The survey and valuation of Winters also included a valuation of the Mill contents. Click here to see the valuation of the mill machinery. To read more about Winters Mill go to the Mills page where detailed information on the mill will be found. This building pictured above and below is referred to as the Cludgie (name for a toilet), but we are unsure what its original use was. 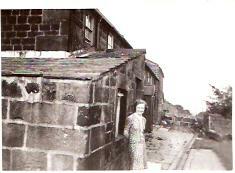 The person on the Photo was known as 'owd Betsy who lived in the cottages. 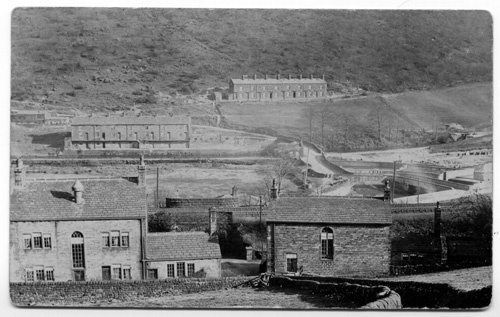 The three photos of Winters Cottages below were taken in the early 1940s. This farmhouse and barn, built in 1684 is below Higher Underbank. In the 1900s, the farm was worked by Thomas Cockroft, and later by his son James who rented extra land from Lacey House. They stabled a cart and horses and had cows, pigs, hens and other poultry. James retired in 1942. . This was built in 1788 by Christopher Rawdon and his wife, Sophia (there is an inscription on a metal plate "C S R 1788"). The Rawdons were part of an influential family with interests in banking and textile manufacture (they owned Callis Mill). The family came to this area from Bilborough, near York, and Halifax, as successive generations established themselves in business and improved the family fortunes. Gradually they continued the westward progress to settle in Liverpool. Christopher Rawdon's father (also named Christopher - there were six generations of 'Christopher Rawdon') bought land in April 1760 from the Horsfall family of Underbank which is probably the site of Callis Mill. "... Yet this was outdone by the ball and supper at Mr James Rawdon's at Underbank last Monday. Twenty different sorts of wine, all sorts of fruit, French and Portuguese. None of the visitors ever saw anything so splendid. There were 85 persons there, 42 stayed the night, two ladys (sic) to each bed, the gents in one room, a warehouse, as E.B. called it, 'ye dormitory,' very comfortable, the floor covered with some mattresses, one for each gent, and plenty of covering or bed clothes; 45 sat down to breakfast there next morning - great betting and gambling - no long whist - nothing but shorts and Loo played all night and till ten next morning." Particulars of Occupiers' Messuage and Names Lands, etc. This shows that the Rawden family owned a large part of Charlestown. The term occupier doesn't actually mean live in it means uses as opposed to rented out. 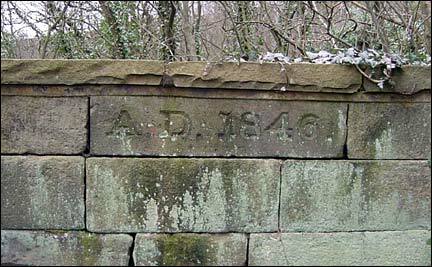 The Rawdons, as major landowners along the valley, were in an advantageous position when the canal and railway companies needed to purchase land for their enterprises. Many textile manufacturers were in favour of the canal, as they expected it to be beneficial in terms of transport routes for their goods, but they had legitimate fears for the safeguarding of their essential water supplies against the demands of the canal. Christopher Rawdon played a cunning game by refusing to sell land to the canal company until the price it was offering had risen to a very high level. In 1839 James Rawdon and the Ashworths sold off plots of land to the railway, no doubt also for a handsome price. In 1893 Underbank Hall was occupied by James and Mary Stott. Mary moved to Woodland View when she was widowed. Eddie Suttle ran a bakery at the back of Underbank Hall until he moved to Pleasant View at the end of the second World War. At some point the Hall was split into two dwellings. From the mid 1950s, both parts of Underbank Hall were occupied by the Spencer family at different times. "bounded on the east by a certain road called Laithe Lane and in length 60 yards. In the west by the remainder of the close called the Ing, also 60 yards. On the north on ground belonging to one John Horsfall (40 yards breadth) and on the south by the turnpike road leading to Halifax also Burnley (40 yards), in whole 2400 sq yds superficial measure or hereabouts and intended by the said John Rawdon for the purpose of building and making other improvements". The house John Rawdon built (now known as Lacy House) bears the date stone 1793, together with his initials, over the original front door and this is repeated in carved stone on the top riser of the cantilever dog-leg staircase. It is possible that the brothers used the same architect as the houses are very similar, with Venetian windows in the gable ends at the attic level, and the same style of carved date stone at the top of the stairs. The stairs are stone treads with wrought iron balusters and mahogany handrail. Both houses have been divided into several dwellings, with alterations and additions, during their lifetime. 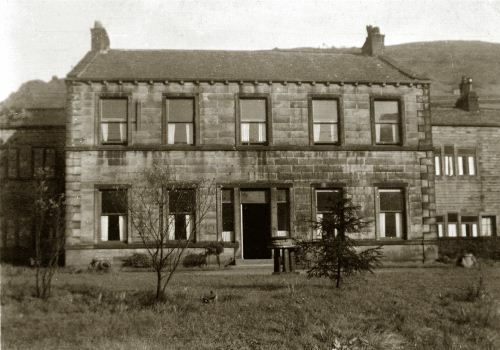 Following the sale in 1855, David Lacy, who had been living at Underbank Hall, moved (?back) to Stoodley where the family already had land and connections (the brothers had been involved in the reconstruction of Stoodley Pike), and Gilbert Lacy moved with his wife, Anna, to Lacy House. 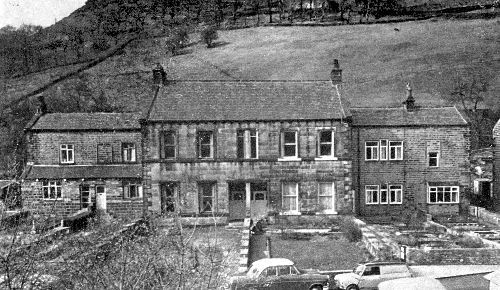 They had six children, of whom one, William Ingham Lacy, had died aged sixteen while they were still living at Mytholmroyd, and the youngest, James Fielden Lacy, had died aged nineteen in 1859 at Lacy House. On census night in 1861, however, the only occupants of the house were Gilbert, aged 54, a Cotton Spinner employing about 200 hands, and his two unmarried daughters, Elizabeth (32) and Susannah (26). It seems strange that there was not even one servant but as Anna Lacy was away from home perhaps she had been accompanied by a maid. The eldest son, Henry, aged 30 probably had his own household at that time. Underbank was occupied by Hannah Lacy, widow of Thomas Lacy, brother to Gilbert, David and John, and her two sons, David Henry and, inevitably, another Gilbert (the repetitive use of forenames in every generation is an inescapable feature of the times!) This household had a 38-year-old servant living-in. John Lacy, now widowed, was living at Underbank Hall and was described as a retired cotton spinner. Also living there was his daughter Hannah (28) and son Thomas (25), a student of Chemistry, and two servants. On census night they also had an overnight visitor, one Martha Fielden, who was very probably Hannah's cousin. Ten years later (1881) John was still at Underbank Hall but the children do not appear on the census. The only other residents are a housekeeper and a housemaid. There have been changes at Lacy House, too. The 1881 occupants are David Lacy's daughter Phoebe, his son-in-law William Henry Sandbach, their four daughters and three servants. John lacy died in 1883 at Underbank Hall. Another ten years go by and Phoebe has been widowed and has returned to her mother's home at Lower Stoodley with six of her children. In 1891 Lacy House is occupied once again by John Stead and his six children. When was Lacy House divided into separate households? There is a (municipal) name plate high on the front wall reading 'Lacy Houses' and there is evidence from birth and death records that it was still known as Lacy House in 1915 but each section was identified as '1 Lacy House' through to '5 Lacy House' by 1925. 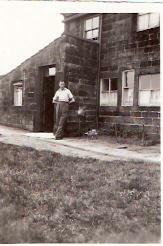 In the 1940s through to the 1960s it was a working farm, running dairy cattle and pigs. 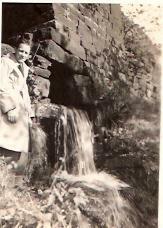 It was taken over in the late 1940s by the Lumb family who had previously farmed high on the Erringden side of the valley. Edgar Lumb published a memoir in 1999 called "born to be a farmer". They found the modern conveniences of electric light at the touch of a switch, gas cooker and new decorations and carpeting throughout, a great improvement. Underbank Avenue follows the railway line from jumble Hole, past Underbank Hall and ends at Lacey House. In 1837 there was a beerhouse in the locality (probably known as the Druids Arms). It has been suggested that William Mitchell's brother had a tiny general shop at the arch entry at Lacey House.